Black and White and Polka Dot is the theme of this sophisticated paper goods pattern perfect for Bridal Showers, Wedding Brunches or Anniversary celebrations. 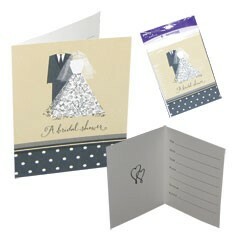 Our fabulous "I Do" Bridal Shower invitations are the perfect way to invite your guests to the party. Invitations are sold 8 to a pack. Please order in increments of 1 pack.